Heat oven to 350°F. Spray three 8-inch round cake pans with cooking spray. In large bowl, beat Cake ingredients with electric mixer on medium speed 2 minutes. Divide batter evenly among pans. Bake 20 to 25 minutes or until toothpick inserted in center comes out clean. Cool cakes in pans on cooling racks 10 minutes. Remove from pans. Cool completely, about 1 hour. In large bowl, beat cream cheese and dulce de leche with electric mixer on medium speed just until smooth. Add powdered sugar; beat just until smooth. Place 1 cake layer on serving plate or cake stand; frost layer with frosting. Top with another cake layer; spread top of layer with frosting. Top with final cake layer. Frost top and side of cake with remaining frosting. Refrigerate about 30 minutes or until serving. Just before serving, mound caramel corn on top of cake. 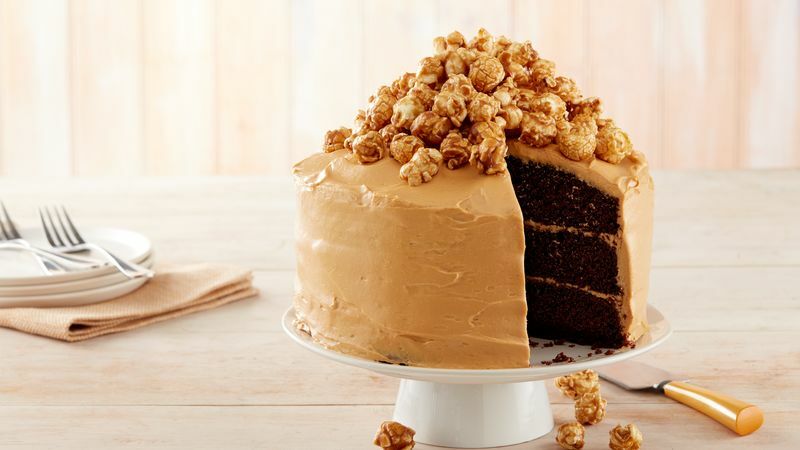 For an extra decorative effect, drizzle caramel corn with melted chocolate, so that it runs down sides of cake. For melted chocolate, place 1/4 cup chocolate chips and 1 teaspoon vegetable oil in small microwavable bowl. Microwave uncovered on High 30 to 60 seconds; stir until chips are melted. Have some fun, and purchase a caramel corn with almonds, peanuts or other nuts added or make your own caramel corn.